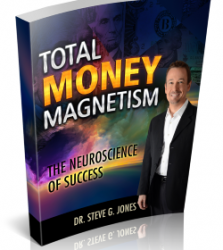 Total Money Magnetism review: Can this hypnosis program by Steve G. Jones help increase our savings? Find out how Steve manifested $59,000 in three weeks. 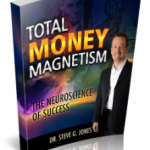 VERDICT: Total Money Magnetism is a great program if you’ve never tried hypnosis before. If you do have other hypnosis programs, then this program can be a good addition to your library since it focuses on the issue of money. Dr. Steve G. Jones has a very soothing voice that makes the hypnosis effective. On the other hand, the lessons inside the e-book are mostly common sense. There are better books about the ‘millionaire mindset’ than this e-book. However, if you don’t have such a book, than the e-book in this program can be a good starting point that you can use before reading more detailed books. Have you ever heard the word money magnetism? If you follow successful people, you will find that they appear to be a magnet for money. They radiate an aura of success, and they constantly get great ideas that, when executed, makes them large sums of money. What is different about these people? What are they doing differently compared to us regular folks? When we look at the lives of successful people, we see that, in the beginning, they weren’t different. Most of them did not start with a significant advantage compared to the rest of us. Is Fear of Failure Blocking Your Money Magnetism? Tony Robbins reminds us of the immutable law of life: “80% of success in life is psychology, and 20% is mechanics.” It means that most of our success (and also failures) is determined by how we think. If our mind is weak, then our actions and results become weak. If our mind is strong, then our actions and results become strong. One of the causes that make our minds weak is our fear. Fear makes us doubt our thoughts, choices, and actions. It robs us of the power that we need to do strong actions and get strong results. A major fear we have is fear of failure. Since we are afraid of failing, we don’t take any risks or opportunities. But success lies on the other side of fear. It means that to be successful, we must overcome our fears. There are several ways we can overcome our fears. According to Dr. Steve G. Jones, hypnosis is one very effective way to release our fears. Can the power of hypnosis help us overcome our fears and do strong actions that make us a magnet for money? Dr. Steve explains that there are two components to our mind: the conscious mind and subconscious mind. The conscious mind is where you are alert and awake, and can think based on reason and analysis. The subconscious mind is where the memories and feelings from past experiences are stored. We don’t always remember these past experiences, but they have an effect on our feelings and choices. The subconscious mind is bigger than the conscious mind. It can have a positive or reinforcing effect when we make choices, or it can have a negative or detrimental effect. When we have a repeating memory or feeling that is detrimental, it becomes a foundation in the subconscious mind. This strong foundation affects us detrimentally when we must make certain choices. So what happens is, when you even THINK about doing something out of the ordinary, your subconscious mind automatically goes into ‘red alert mode’ and produces emotions such as fear and discomfort, to encourage you to stay within the boundaries of your comfort zone. When we have a detrimental foundation planted in our subconscious mind, it becomes a tough task to uproot it and replace it with a reinforcing foundation. But, it isn’t impossible. With hypnosis, we can target and reprogram detrimental beliefs, including fears, relatively quickly and easily. There are various hypnosis programs that you can find. One of them is Total Money Magnetism, made by Dr. Steve G. Jones. He is a multimillionaire clinical hypnotherapist whose client base ranges from Hollywood actors, top business executives, national athletes, to people at NASA. Total Money Magnetism e-book. The e-book is 197 pages long. It consists of four parts, and each part has several chapters in it. There is an introduction at the beginning and a resources section at the end. Part One: Hypnosis, Your Weapon of Mass Wealth Attraction. The first part introduces Dr. Steve, his background, and how the hypnosis audio tracks work. This part contains Chapter 1 to Chapter 5. Part Two: The Five Fundamentals of Ultimate Money Magnetism. The second part discusses what you need to do to improve your money magnetism. This part contains Chapter 6 to Chapter 29. Part Three: The 10 Secret Success Principles of the Ultra-Wealthy. The third part gives you lessons about what wealthy people do to become wealthy. It contains Chapter 30 to 39. Part Four: How to Get the Most Out of Your Wealth. The fourth part talks about life after wealth. It contains Chapter 40 to 42. Total Money Magnetism audio book. Dr. Steve recently recorded and released an audio book version of his program. The audio book has the same content as the e-book. You can listen to the full book that is 206 minutes, or you can download each chapter and listen to them separately. What’s great about the audio book version is that you can listen to it while you are driving or doing other activities. Listening to positive audio tracks while driving is a good way to make use of your commute time. I haven’t yet consumed the other files. But they are audio and video files that give bonus lessons about building a millionaire’s mindset and interviews with successful millionaires. I will update this review once I have listened and watched to these bonus files. From the six digital files above, the main ones are the main e-book and the hypnosis audio tracks. You can read the book from start to finish first and then listen to the hypnosis tracks. But I recommend you read the first part of the book, then listen to the tracks, then read the rest of the book. I listened to the tracks after finishing the books and felt that I should have listened to the tracks first. The first part of the book explains the mechanics of hypnosis. It especially explains the technology that is embedded into the audio tracks made by Dr. Steve. This neuroscience technology helps to create new functional neurons (neurogenesis) in your brain to improve your money magnetism. The way the tracks work is explained in the following five steps. Wealth building script. Once we are extremely relaxed, we listen to Dr. Steve say affirmations that improve our money magnetism. Each track contains a different affirmation according to the topics I’ve mentioned above. This step is where the reprogramming happens in hypnosis. Amnesia. The fourth step aims to make our conscious mind ‘forget’ the affirmations we just heard. The information is stored in our subconscious mind. But we want the conscious mind to forget it so that our conscious mind can’t reject the new, reinforcing affirmations. Trance termination. The final step brings us out of hypnosis to full awareness. I’ve never listened to hypnosis tracks before, so I didn’t know what to expect. At first, I thought it was weird that the hypnosis began with descriptions of scenes. I thought to myself, “What do these scenes have to do with getting rich?”. But then I realized the scenes are part of the induction step to make us feel calm and relaxed. Dr. Steve Jones has a very soothing voice that is very effective to make us get into a deeply relaxed state. I usually fall asleep when listening to meditation tracks, but I tried to stay awake when listening to the hypnosis tracks. Occasionally I did doze off for a while, but Dr. Steve says it’s OK because the affirmations still get stored in our subconscious. Other times, I can stay awake and listen to the affirmations. Once I am brought out of hypnosis, I feel refreshed and full of energy. Previously, I often feel afraid about my money issues. I fear about running out of resources (money). But after listening to the hypnosis tracks, I feel a difference. I feel calm, optimistic, confident and resourceful. The fear has decreased substantially, and I have the energy to think and find creative solutions for my problems. I listened to one track each work day. Moving forward, I plan to listen to one track each week to keep refreshing my energy. You can listen to one each day, each week, or as you need to. Once you have listened to all the tracks, the lessons in the e-book will have a big impact on your thoughts. #1 – Dr. Steve G. Jones’ voice is very soothing. I feel that the success of the hypnosis audio tracks is because of Dr. Steve’s voice. He has a deep and soothing voice that eases us into the hypnotic state. He changes his voice according to which step we are in (induction, deepening, affirmation, etc.). I can feel the difference in energy in his voice, and it’s effective in changing my own energy. #2 – There is plenty of bonus material. I haven’t heard the bonus MP3 tracks, videos, and interviews. But extra lessons are always welcome. They add depth and extra insight into the program, especially the interviews with real-life millionaires. #1 – The lessons in the e-book don’t impress me. Dr. Steve shares his experience about the methods to improve our wealth. The lessons are correct, but they are average in my opinion. If you don’t have any other self-improvement book about wealth, then this program is a solid place to start. But if you’re like me (and most other self-improvement people), you probably already have a book about increasing wealth that is better than this one (Think and Grow Rich comes to mind). By applying the lessons he shares in the book, Dr. Steve manifested more than $59,000 in three weeks. Had he not manifested that amount of money, he would have been forced to declare bankruptcy. I have not yet any tangible, measurable, significant results yet with this program. But I will update the review once I have listened to the bonus files and got measurable results. As a conclusion, if you are looking for ways to increase your money magnetism, this program is a good investment. If you have never tried hypnosis before, the audio tracks make this program a good investment. The lessons in the e-book may not impress you if you already have books about building a ‘millionaire mindset’. But it is still a solid start for those of you who are beginning your wealth journey.